This book is designed as a self-help tool for those suffering from depression or anxiety. If we are feeling down, we often identify with the unhealthy part of our self, mistakenly thinking that is who we are. Holistic Therapy helps access the strong and healthy parts of ourselves, teaching new coping strategies, thinking habits, ideas and most importantly a new awareness of who we REALLY are. We may be amazed to discover that many of the labels we have lived under for years can begin to be replaced with a more positive, upbeat and helpful self-identity.This book has been written to offer some tools for learning a new skill. And that is the understanding that we are more powerful than we think. "I loved every moment I spent immersed in this book. It was like re-discovering myself, in a very soothing and delightful way. It's helped me get a holistic perspective on my life and is packed with excellent practical approaches to managing thoughts and feelings and getting centred. I highly recommend this book whether you are in the mood for resolving a crisis or simply for joyous self-discovery. 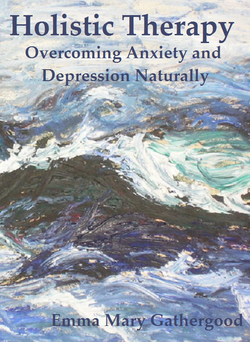 It's beautifully and accessibly written, with a perfect and reassuring balance of warmth, research and realism"
"Written by an experienced occupational therapist who has studied many different approaches, this self-help book provides useful advice for those who would like to know what the options are for overcoming depression and anxiety naturally. All in all, this is clearly written and very helpful guide". What a very useful self-help, self-check easy to read and understand handbag-sized book. How very informative particularly when one tries to make sense of the difference between the various therapeutic approaches, depressive feelings, anxiety and how the body responds to stressful situations. It is also a very gentle read and serves as a reflective tool for self-enquiry and healing. S.P. Bhavna Patani from the Janki Foundation suggested that I have a look at your book and see what I think. What a very useful self-help, self-check easy to read and understand handbag-sized book. How very informative particularly when one tries to make sense of the difference between the various therapeutic approaches, depressive feelings, anxiety and how the body responds to stressful situations. It is also a very gentle read and serves as a reflective tool for self-enquiry and healing. What I particularly like about the book is that of its holism and an aide memoir for me. I shall certainly recommend the book to my contacts.